1. Whatever they are selling the honey for at the farmers market is probably a bargain, compared to getting set up and producing your own. 2. 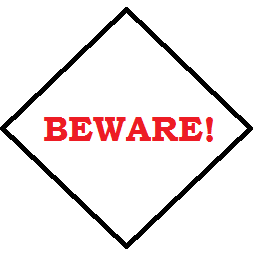 Provide a watering hole for your bees or they will become unwelcome visitors at your neighbor’s pool or fountain. 3. Join a bee club. 4. Find a mentor or friend to go through the experience with you. Getting started with bees is not the same as adding a few chickens to your backyard. You could make any sort of shelter out of found materials for your hens. Bees, on the other hand, need special housing if you want to manage them easily for a honey harvest. In the wild, of course, they do well on their own without our interference. 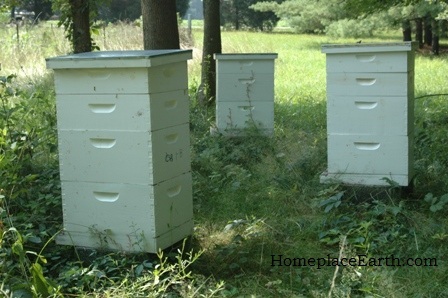 The regular box hive is what most people associate with beekeeping. It was refined about 1850 by Rev. Lorenzo Langstroth with his concept of “bee space” making it easier to remove the frames. New thinking is going the way of top bar hives. 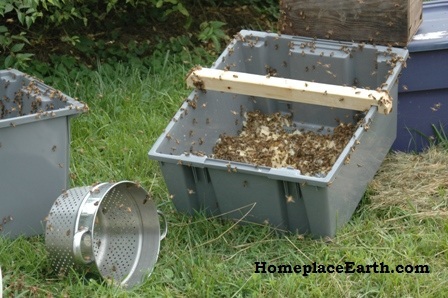 I know a few beekeepers who have started using a top bar hive, but I don’t know if they’ve extracted honey yet. I understand that you have to destroy the comb to get the honey. That leaves you with plenty of wax to make into candles, but the bees have to produce that much again for a place to store their honey. With the Langstroth hives, the frames with comb and honey can be spun in an extractor to take the honey and leave the comb intact. There are pros and cons for both hives. If you want to learn more about those top bar hives, there will be two people speaking about them at the Mother Earth News Fair in Seven Springs, PA in September. Their websites are http://www.goldstarhoneybees.com/ and http://www.beelanding.com/. I’ll be there as well. I started with one hive, buying a beginner kit, plus the coveralls, plus whatever additional equipment I needed for the one hive from Dadant. Adding the bees(which might cost about $75), I probably spent about $350. Since the first year the bees are building their home by producing comb in the two brood boxes and storing their winter food, they generally don’t have honey to spare. I was looking forward to extracting some for myself the second year. My bees, however, didn’t survive the winter. There are so many reasons that may happen. They can have food in the form of honey or sugar water in the hive and if it’s not right next to them, they’ll just crawl into their little cells and starve. The weather is a big factor and even if they look great at the beginning of March and you pat yourself on the back for getting them through the winter, a cold rainy spell could take them out two weeks later. I found out after I started with one hive that it’s recommended to start with two. That would make the cost be about $500 to get started. So while you’re learning if you even like to use honey on a regular basis, what you can buy at the farmers market is a bargain. 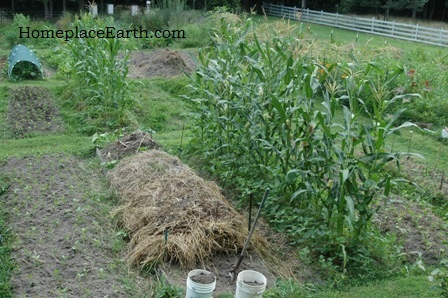 Providing water for my bees is something that took me by surprise. Luckily,we have great neighbors who welcomed them at their fountain, which is right next to their door. Thanks Willie and Joyce, for being so nice to my bees! When I realized that was happening, I put out a bird bath and keep it filled. Now, they spend more time at home in our yard. Some of my beekeeping friends have neighbors who are not so welcoming. Joining a bee club in your area is a good idea. You will meet others who really know what they’re doing, along with people who are just learning like yourself. Bee clubs have speakers and often sponsor classes. Some clubs own equipment such as extractors that members can borrow. I joined the Central Virginia Beekeepers Association–East and have made many new friends in the process. Besides learning much from what goes on in the meetings, one of our members, Paul Hodge, puts out a monthly to-do list for us. It was through his encouragement and guidance that so many of us have divided our hives and started a nuc this year to raise new colonies. Thanks Paul! Hook up with a mentor and/or friend for this journey. You can most likely find one at the bee club. Sometimes they have a list of members who have volunteered to be mentors. Just ask. A mentor can take you through the initial steps of knowing what to do and can be a resource to call on for help. A good friend is someone who will join you regularly working your hive and extracting honey. A local mentor in my area was Mr. Mac, who passed away the year I got started in bees. I never met Mr. Mac, but I’ve sure learned a lot from him through those that he mentored over the years. “Mr. Mac always said…..” peppers many conversations. Thanks Mr. Mac, for teaching so many people, so that they can teach me! This year I have three hives. One is a strong hive that made it through the winter, one is a split that I made from that hive this spring, and the third is from a package that I ordered in December for April delivery, not wanting to assume my bees would overwinter. I have honey this year! It is the first appreciable amount from my bees that I’ve had. That strong hive filled two supers of honey for me. My bee buddy, Angela, and I extracted it recently along with a super from her bees. Until now, I may have had a few frames of honey from my bees that I extracted by cutting off the cappings and leaving the frames upside down in a picnic cooler so that the honey would drain out. I put canning jar lids down as spacers to hold the frames off the bottom of the cooler. 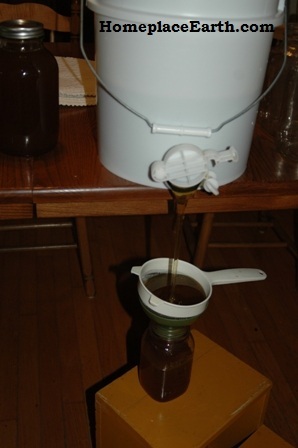 I have gotten together with Angela before to extract honey and we uncapped it over canning pots to capture the wax. This year I splurged and bought an uncapping tank from Brushy Mountain Bee Farm. This tank is actually called a multi-use straining system in their catalog. Angela owns the extractor we use. Uncapping requires a long serrated knife and special ones are made for that job. A five gallon plastic bottling pail is good to have. Even the years I didn’t get any honey from my bees, I still had honey when another bee buddy, Freda, gave me her surplus. The extractor has to be drained periodically during the process and you have to put it somewhere in a hurry. You bottle it from that bucket. A strainer that fits over the top of the bucket is good to strain out the bits of wax and bee parts that may come off the frames. I have such a strainer, but couldn’t find it when we extracted, so in the picture you see it being strained as it goes into the jars. I much prefer straining it as it goes into the bucket. When you’re done, just leave the sticky equipment outside for the bees to clean up. There is so much to learn about beekeeping and I hope you decide to jump in and be part of it. Go ahead and join a bee club even if you don’t know when, if ever, you will get bees. Older beekeepers are probably looking for volunteers to do some heavy lifting for them while tagging along in the beeyard. That could be you! For those who are local, beginning today I am giving a series of talks for three weeks at Midlothian and Bon Air Libraries in Chesterfield County. 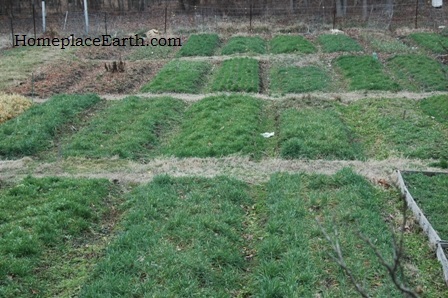 I’ll present Feed Your Family from Your Own Backyard, Part 1 (GROW BIOINTENSIVE), Part 2 (garden planning), and Part 3 (cover crops) Tuesdays at Midlothian and Wednesdays at Bon Air. Contact the library for more information. Attendance is free, however registration is recommended. See you there.